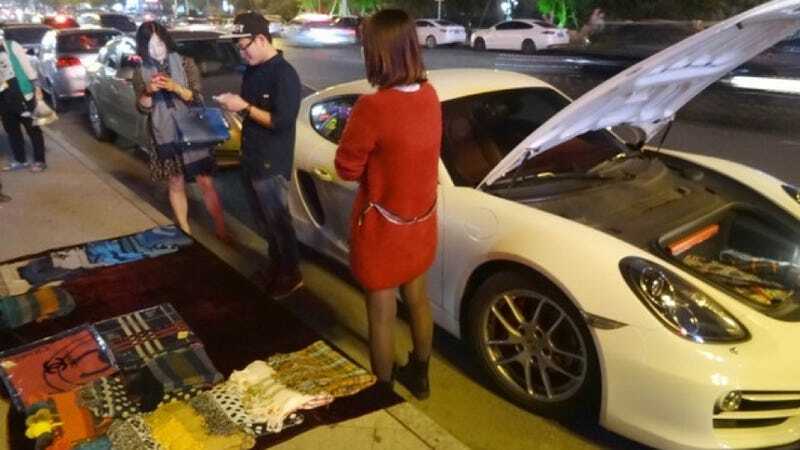 Folks in Shaoxing City raised eyebrows when some punk pulled up in a Porsche Cayman and opened up an impromptu scarf-vending stall on Shengli Dong Road. He said he felt bad asking parents for gas money after they bought him the car. Shanghaiist's Lucy Liu says the cops weren't having it. I guess it isn't legal to just start a store anywhere you want in Zhejiang province. After he got a stern talking to, the kid blazed out to another spot with his scarves and a female companion in tow. "I sell scarves here just to earn money to buy gas for my car," he apparently told News163, which went on to explain that "his parents paid for the snazzy Porsche but he didn't think that it is right to ask for gas money." This gentleman is apparently considered "second-generation Tuhao;" a derogatory Chinese colloquialism for "new money" generally extending to mean entitled, gauche, you get the idea.